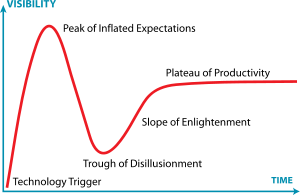 I was collaborating with some IBM colleagues on an article, and one of the collaborators introduced me to the term hype cycle. It was coined by the Gartner Group to describe a predictable pattern associated with technology breakthroughs. Initially everyone gets all excited and expectations soar to unwarranted heights. Then comes the trough of disillusionment as reality sets in. Eventually, the audience resets its expectations, and acting on those new expectations, the technology is put to productive use. 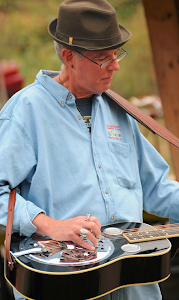 I've been really digging in on my Dobro and have made a lot of headway in the last six months. I have a goal to reach a certain level of competence within a selected repertoire of songs by the time I go to the Steve Kaufman Acoustic Kamp in June, and I'm just about where I wanted to be. I had one of my monthly lessons with David Ellis this weekend and reviewed the fiddle tunes (popular in the nightly jam sessions at camp). While doing so, I realized that I don't have great breaks, what I have are good fakes. At one point as I'm about to do Blackberry Blossom for David, I say, "The only thing this will have in common with Blackberry Blossom is the chord progression." In other words, I play simplified versions that capture the spirit of the melody, while allowing me to play at jam speed. I'm almost 63 and it seems anytime I get an ache or I feel a bit puny, I immediately imagine it to be some fatal illness. During one of those funks and on my way to a recent checkup, I asked myself what I would do if the doctor said I had six months to live. I was surprised by the spontaneity and the clarity of my response: "I'd quit trying to play Saint Ann's Reel so damn fast and just enjoy playing all the notes." OK, this is the last thread and the one that really triggered this blog. I was driving to the monthly SEBA jam on Sunday, feeling tired and even a tad bit depressed. Something in me didn't want to go--I just wanted to turn around and go home, crawl into bed, and pull the covers over my head. I did an uncharacteristically mature thing: I turned around and went home. I think that with anything (and possibly anyone) we love, we go through similar patterns to the hype cycle. But instead of being a one time thing resulting in a static plateau--it has the potential to keep repeating itself at increasingly higher levels of satisfaction (or competence, depending on what you're measuring). But each of those cycles is separated by a trough of disillusionment. For example, I had great expectations that I would become good with all of my practice and dedication. But at my new level of good, I could see a level of better that was still ahead. So instead of feeling good, I felt not-so-good. Mistake One: Quit trying to get faster at Saint Ann's Reel and just enjoy playing all the notes. What's so wrong with that? Well, if I KNOW I only have six months, then nothing is wrong with that. But what if I could know with that same certainty that I had another 20 years? In that case, I'd like to get better at it during that time. Mistake Two: Do the cowboy thing and "get right back on the horse that threw you." That can lead to an even deeper trough of disillusionment as you learn to not enjoy the thing (or person) you are passionate about. What we need to do when we hit the trough is to stop for awhile and enjoy what we have. Sure, slow down on Saint Ann's Reel for a while and enjoy it. There needs to be a period where we cash in some of our satisfaction equity and just appreciate what we have accomplished. So what if my breaks aren't great, that's OK. I'm going to go to camp with some good fakes that will let me jump into the jams and pull my own weight. It's going to be a lot of fun. And I've already talked with David, and after June, he and I will sit down and set some new goals. So until then, I'm going to have some fun and not worry about how good I need/should/could be. In the meantime, I know I would like to get better, and I know I will get better. But for now I'm giving myself permission to enjoy where I am today. So if you have 6 months to live and concentrate on enjoying the notes-Great! And if you unexpectedly live twenty years more having spent six months enjoying the notes will lead you to an ever higher level. You don't ever lose by focusing on the journey rather than the end. In my case at any rate, getting better has meant getting out of my comfort zone and stretching the envelope. If I just sit back and enjoy, I will stay at that level. That's why I think it is important for me to linger periodically and enjoy--so I am not continually in a discomfort zone. But it's also important to know when it's time to grow some more. It's not so much focusing on the "end" of the journey, as it is knowing when to break camp and start the next leg. I loved this post for several reasons, and it's similar to my adventure in learning to play the violin (as an adult). Thanks for the diagram and for the reminder that I need to get some new goals set.